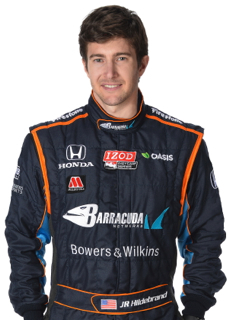 JR Hildebrand will share driving duties on the Barracuda Network IndyCar with Luca Filippi for the remainder of the 2013 season. Photo courtesy of Barracuda Networks/LAT. Indianapolis, IN – August 13, 2013 – Barracuda Racing announced today that JR Hildebrand and Luca Filippi will fill the seat of the No. 98 car to complete the 2013 season. “I’m really excited to join Barracuda Racing this year, and have to give a big thank you to Bryan and the team for the opportunity,” said Hildebrand. “Sonoma is where I got my racing start, so it’ll be great to have another new experience there with a new team, and one that I’ve heard nothing but great things about. Finally, Hildebrand will finish out the season, competing in the MAVTV 500 at Auto Club Speedway, where he lead 56 laps in last year’s IndyCar season finale. “JR is an exciting prospect for us,” said team co-owner Bryan Herta. “He’s a talented driver and it made sense for him to be able to compete at his ‘home’ races in Sonoma and Fontana. Barracuda Racing has a full schedule of events next week, leading up to what it considers its “home” race, just a short distance from Barracuda Networks headquarters. The team will take part in the “Food Bank 500” media event on Tuesday, August 20 to raise awareness for hunger in conjunction with Second Harvest Food Bank.